Our most recent useless gadget had the pleasure of being something not so useless. In fact, its uselessness will likely depend on just how old you are and if you remember carrying your photos around with you. I’m too young to remember this, but Gary – the producer of the show & my dad – tells me that in the 70’s, people used to carry pictures of their family and friends around on a keyring. Before the clasp started becoming its cartoon geek trend for what it is today, it was used as a means of carrying little memories. This isn’t used much today but the Digital Photo Key Ring might change this. There are a lot of these out in the market and the Kaiser Baas one we’re reviewing is hardly different from many of those, but it is the one we picked up from a local store so we’re looking more at it than those cheaper ones. There's not a lot to it and it fits on your keyring. Strangely, the plastic isn't the least bit scratch resistant making it a sort of useless keyring. Kaiser Baas is an Australian company known for multimedia devices. You might have seen them if you’ve ever been in the market for a TV tuner or perhaps one of the nice wooden digital frames that exist here and there. While their digital frames can often come with all the fix-ins (Bluetooth included in at least one model), the Digital Photo Key Ring has its claim to fame in the form of a 1.5 inch display you stick on your key-ring and take around with you. Together with a small amount of in-built memory and a USB port, you can bring your memories anywhere you go. 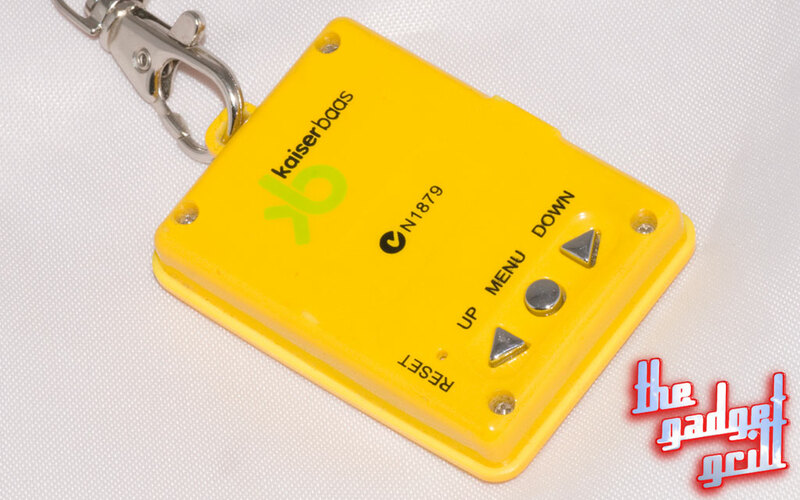 It doesn’t need a lot of design elements and that’s good because this pocket Kaiser Baas electronic frame has almost nothing to it. A coloured shell with a 1.5 inch screen inside of this flanked by a USB port on the side and three buttons on the back make up all this gadget has to offer. And the idea is simple enough: plug it in, move your images to it, and then when you want to look at them, you turn it on and either watch a slideshow unfold your favourite people or flick through them manually using the buttons on the back. The pocket photo key-ring does work, but it’s the sort of “barely working” that’ll make you wonder why you spent your money on it. A menu system controlled by the back buttons aims to let you have some sense of control over the device, but since you’re not really controlling much, this seems a little like a waste. When you look at this gadget, the idea of “rebranded crap” comes to mind and that stays with you when you look at the software. Quality isn’t exactly something that has been dolled out here and you’ll find quickly that the software isn’t quite user friendly and only works on Windows XP & Vista, a choice that’ll leave Mac users out in the cold. It’s ok Mac people. You have an iPod. It’s superior. Go play with that. The software is simple but still junk. You’ll select the images you want, the software will give you a square to crop them into, and then will convert them into bitmaps for the pocket picture frame. You don’t get much of an idea when or how the pictures are being moved to your device and this almost limits the software’s usability. But somehow you get it across and then you can view your images in all their glory. Which isn’t a lot, to be honest. Anything you’ve uploaded won’t retain its colour, brightness, or contrast values and will likely look like it was bleeding out all over the carpet, or LCD screen as the case may be. From the thick lines that seem to be present as you look down at your images to the sheer lack of quality, it’s obvious that this was one of those cheap things to manufacturer. The buttons are poorly laid out, the image quality isn't so hot, and the software is junk. Why would you buy this? You're desperate for a present for Mum & Dad. We picked the Kaiser Baas Digital Photo Key Ring up for a little over $15 AUD which makes it not a bad little gift for a family member who loves the concept of having their family photos with them in a small and easy device. I will say that if you’ve already got a phone, video game console, or pocket computer from the past four or five years, you should probably ignore this as your device probably already does what this does. 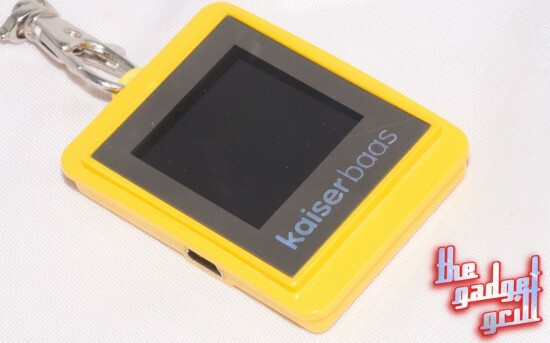 Most people’s phones have the ability to view & store images and the quality of the screen on the Kaiser Baas Digital Photo Key Ring is such that your phone would have to be from the era where colour phones were just coming on the market to be worse. But for grandmothers and little kids who want to carry their memories around with them, it’s a great little toy and worth the price. I agree!….Total junk!!!!! !………I can’t believe I bought one. …Maybe mine is a newer version? -Although it looks exactly the same as the picture above. It’s still a piece of junk. Mine won’t work without being connected to my mac and I have tried resetting it and all. ..I guess you can’t expect much for like, 15 bucks. In a row provided by the dudes is very handy on behalf of us, Thanx to alllllll …. When connected to PC USB port Windows (7) closed down and computer shut down. That would most likely be a hardware problem, but with no real details of the incident, it’s really difficult to diagnose. We use USB ports and many different devices on several different PCs on a daily basis with no issues whatsoever. I’d be willing to bet that your PC may have some issues.